This stream is designed to prepare the new generation composite radio professional who combines the roles of news gatherer, scriptwriter, interviewer, anchor, and producer. 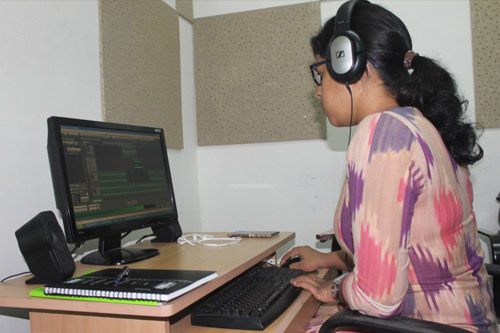 Students cross the technology threshold early in the stream and are soon adept at field recording with mini disc or flash card recorders, use of microphones, post production including sound perspective, layering and mixing, and non-linear editing with Adobe Audition software. Specialized and intensive modules take students through the essentials of writing for radio, exercises in voice culture, structuring radio features and evoking sound portraits. 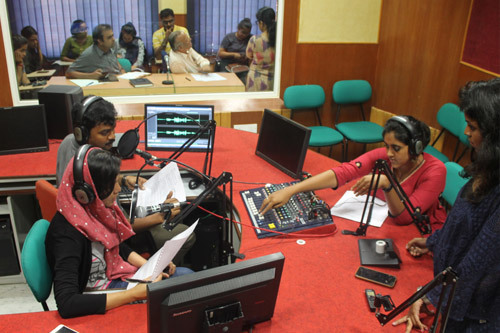 They gain a quick understanding of the immediacy and influence of radio as a medium and develop a working knowledge of the types of radio journalism and production. Hands-on, deadline-driven exercises are matched by lectures and workshops aimed at a deeper appreciation of the history and evolution of the medium, the transition from analogue to digital technology and its impact in terms of reach and accessibility, commercial and public interest models, and the impact of corporate consolidation on radio journalism and ethics. Students learn to develop an ear for sound and, in particular, for sound-bytes that become meaningful information. They alternate between studio and field work, producing daily features that are web-cast for peer and expert evaluation. The Radio facility consists of a recording studio and postproduction pit with multi-track digital recording and mixing consoles; and six digital audio edit systems.